Sonatas: 1 in f, op. 6, 4 in f sharp, op. 30, 5, op. 53, 7, op. 64 � "White Mass", 9, op. 68 � "Black Mass"
I am not very convinced by the logic of this compilation. 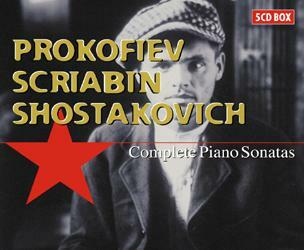 Prokofiev and Shostakovich make a reasonable pair, but there must be many admirers of their music for whom Scriabin is anathema, and vice versa. And, if the idea was to present a conspectus of Russian piano sonatas in the first half of the 20th Century then Rachmaninov and Stravinsky should have been added. This would not have mattered so much if all three composers had received outstanding performances, but alas, only two of them do. Right from the first sonata, a very early work, Austbo presents his credentials as a Scriabin interpreter. For all its post-Chopin leanings, this work already proclaims its author in its menacing rhythmic counter-melodies and its alternation of euphoria and stasis. Austbo has the measure of this music�s structure, realising its power without losing control and allowing its meditative moments to drift without actually stopping. His control of texture is most impressive; he can fill the air with trills and then bring out a melody from the midst of them, and he always seems to know which melodic strand, in the most teeming textures, is the one we need to hear. So consistent is he that I feel disinclined to point to any moments in particular. Certain classic performances of individual sonatas, by the likes of Horowitz and Richter, will never be unseated (the laser-light which Horowitz beams onto the "Black Mass" sonata is unique and unapproachable) but I was sufficiently convinced not to feel the need to seek them out. As a set, this is as good as we are likely to get. I listened in chronological order but my initial bewilderment as to why they had not been issued in that way was countered by two considerations. Firstly, the second disc has slightly more bloom to the sound than the first. There�s not much to it and the first is quite acceptable, but if you dodge back and forth you obviously notice the difference. Secondly, for those new to the music, each disc presents a compendium of Scriabin�s development, neatly encapsulated within a single listening space. Both discs cover the same ground, but with different music. However, looking at this as a package for a first-time buyer, the complete absence of any sort of booklet notes does seem to me to be serious. Better this than empty waffle, maybe, but this is a case where helpful guidance can really make a difference. Still, the performances allow the music to speak for itself. The trouble is, if you are going to buy a set of 5 CDs, even at a very low price, it is hardly worthwhile if only two of them are any good. So what about the rest? McLachlan encompasses the notes of these frequently complicated works both confidently and comfortably, and his approach is a basically unfussy, musical one. So far so good, but alas, a glance at the scores shows how much is left out. The first two pages of no. 3 run the whole gamut of dynamic markings from fortissimo to piano with some steep diminuendos and one hairpin marking and McLachlan ploughs through the whole lot at a steady forte, making only a token reduction in the sound (coupled with an unmarked rallentando) when he reaches the pianissimo. Prokofiev is no less detailed in the variety of touches he calls for, with legatos, long notes separated from one another and some staccatos about which he evidently felt so strongly as to separate the notes from one another with a rest. Again, McLachlan makes nothing of all this. When Prokofiev suddenly indicates "p secco" after a few bars full of legato slurs, I can detect no change of sound or style. Then, at the pianissimo theme, careful accenting is required to avoid giving the idea that the first beat of the bar is on what is actually the second quaver. This risk is far from avoided, and it makes the music seem banal. At the moderato section, Prokofiev�s "pp tranquillo" is anything but that and the "semplice e dolce" theme, wonderfully tender in the right hands, is merely perfunctory. The sudden drop to piano at the bottom of the first page of the finale of no. 4 is similarly ignored and in the first movement of this work McLachlan seems to relate to the music only when it is loud. Comparison with the Richter version recently issued by BBC Legends reveals this music to have a range of expression that you would never imagine if you knew only the McLachlan version. And incidentally, at the penultimate bar of line three of page 8, my score has g natural, not g sharp, and Richter�s evidently has, too. The "Andante assai" of this same sonata has to be broad, but this 8-in-a-bar trudge makes it a long haul indeed (and why the sudden doubling of the tempo for a few bars on page 14?). Richter shows that a more forward-moving tempo is not synonymous with haste. In a way, performances like this do more damage than ones that are patently full of splashes and wrong notes, since in that case anyone can hear that the performer is at fault, while these performances sound, on one level, perfectly plausible, and will lead those who have no means of comparison (precisely the public these Brilliant sets are aimed at, presumably) to suppose that this is just boring, undistinguished music. Beethoven played in this way tends to shine through; Prokofiev was not exactly a Beethoven and great care is needed to bring out his qualities. It is true that, from no. 6 onwards, the higher quality of the music means that something, at least, gets through � it would take more than good intentions to destroy the "Andante caloroso" movement of no. 7 � but even so, a comparison with the version of no. 6 recently issued in the "Richter rediscovered" album reveals the music to have infinitely more to it than you would ever imagine here. To give just one example, the "Allegretto", in Richter�s hands, expresses a range of emotion that runs from the grotesque to the pathetic; McLachlan�s all-the-same approach seems merely dogged. It is also true that McLachlan seems particularly identified with no. 9. Often seen as the weaker of the last three sonatas, it actually sounds here to be the finest of them. Did McLachlan maybe make a speciality of this one before he decided to take up the whole cycle? I think the problem is that, at about this time, Olympia engaged this pianist to record a vast amount of Russian music � there was a Miaskovsky cycle, I remember - , too much, probably, for him to apply much more than an all-purpose competence to it all. This all reflects rather sadly on the ways of the record industry itself. If McLachlan can do better now, perhaps he should be allowed to show this. There has been a tendency to look on the Shostakovich sonatas as fairly expendable compared with the long series of symphonies and string quartets. However, while the McLachlan Prokofiev leaves one feeling that this is rather dull music, Colin Stone, with the help of a recording whose full-blooded presence puts the others in the box in the shade, but above all with the vitality and conviction of his playing, reveals them to be well worth knowing. No. 1 (1926) is a fascinating example of the early "modernist" composer and Stone�s performance is hard-hitting (but not hard-toned), while not neglecting the quieter moments. The Second Sonata (1943) is a more "orthodox", almost neo-classical work, but it is shown here to have a wide-ranging content and a particularly haunting last movement. As with Austbo�s Scriabin, Stone leaves you feeling that you do not need to search for comparative versions, which in this case are not many. Gilels�s version of no. 2 has acquired an enviable legendary status just by remaining unavailable. I hope to hear it one day. But I am very happy with Stone. It�s difficult to know what to say, overall. I suppose you might think that the Scriabin and the Shostakovich in themselves justify the modest price of the set, but if you do make that decision, then get what Richter performances of the Prokofiev you can find.